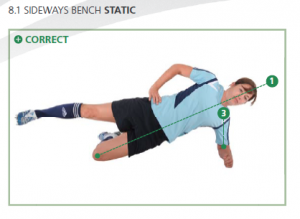 Today we will discuss Part 2 of the FIFA 11+ Warm-Up Programme. If you missed Part 1 in my previous blog, check it out here to catch up! For a quick refresher, the FIFA 11+ Warm-Up Programme is a 3-part program used all over the world to prevent soccer injuries and improve balance, strength and agility during play. All 3 parts should be completed in order at least twice per week prior to training sessions. For competition days, only Parts 1 and 3 should be completed. Part 1 outlined the exercises 1-6 which focused on different running and agility drills. 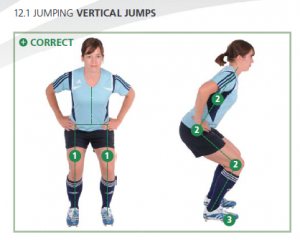 Part 2 of the FIFA 11+ involves exercises 7-12 that focus on strength, plyometrics and balance. I will be outlining the ‘Level 1’ version of each of these exercises; every player should start here. 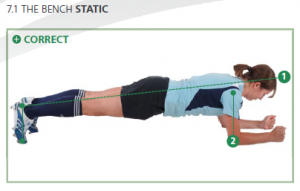 Only when an exercise can be performed without difficulty for the specified duration and number of repetitions should the player progress to the next level of the exercise. The subsequent levels are outlined in the FIFA 11+ workbook. This exercise strengthens your core muscles, which is important to ensure stability of the body in all movements. During this exercise, lift your upper body, pelvis and legs up until your body is in a straight line from head to foot. Draw your shoulder blades in towards your spine so that they lie flat against your back. Your elbows are directly under your shoulders. Pull your stomach and gluteal muscles and hold the position of 20-30 seconds. Return to the starting position, take a short break and repeat the exercise. During this exercise, lift your pelvis and uppermost leg until they form a straight line with your shoulder and hold the position for 20-30 seconds. The elbow of your supporting arm is directly under your shoulder. Return to the starting position, take a short break and repeat the exercise on the other side. 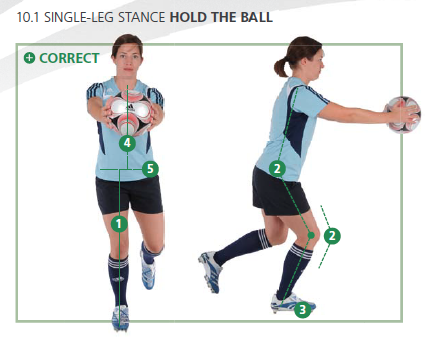 Assume the starting position, standing on one leg and holding the ball in front of you in both hands. Bend your knee and hip slightly so that your upper body leans forwards slightly. When viewed from the front, the hip, knee and foot of your supporting leg are in a straight line. Hold the raised leg slightly behind the supporting leg. During this exercise, hold your balance and keep your body weight on the ball of your foot. Hold for 30 seconds, change legs and repeat. During this exercise, slowly bend your hips, knees and ankles until your knees are flexed to 90 degrees. Lean your upper body forwards. Then straighten your upper body, hips and knees. When your knees are completely straight, stand up on your toes and then slowly lower yourself down again, before straightening up slightly more quickly. Repeat the exercise for 30 seconds. Stay tuned for my blog next Monday to learn more about Part 3. 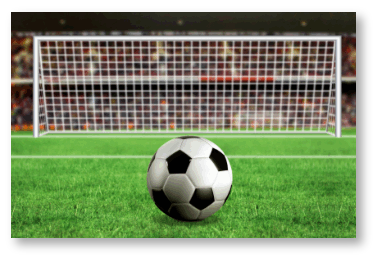 If you have any questions about the FIFA 11+ protocol or are wondering how to implement it into your team’s regular routine, come speak with any of our knowledgeable practitioners. 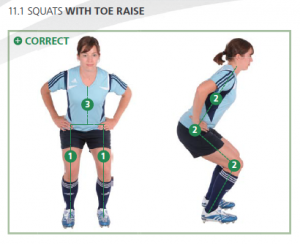 We can help you with proper form and technique for all of these exercises and help to ensure you are doing things correctly for optimal injury prevention benefits.